What do we want robots to do for us? The field of robotics is making great leaps in robot abilities, but these abilities come one at a time. We won't have Rosie from The Jetsons until the various specific tasks are combined into one machine. When that happens, they will take over. But until then, you'll have to choose the purpose of your robot, and hope it can do that specific task well. Here are some of the most recently-unveiled robots and what they can do. The Head Care Robot from Panasonic has a chair and a sink built right in. Get in and let the machine scan your head to determine its exact shape. Then shampoo and water is dispensed, and 24 robotic fingers go to work: eight massage your neck and the rest massage your scalp until it's completely clean. Then it's rinse, conditioner, massage, rinse, and blow dry. The process resembles a high-tech automatic car wash.The Head Care Robot is in public testing at Super Hair Seo salon in Nishinomiya, Japan. 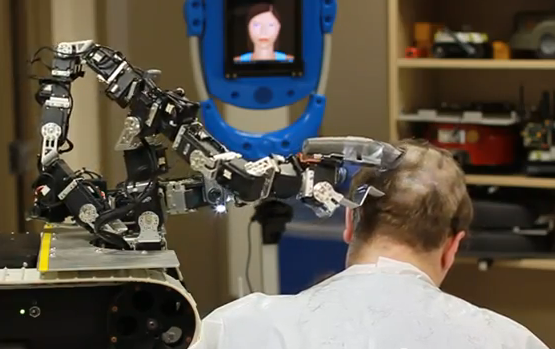 The Robot Barber actually has arms coming at you with electric razors. The machine is the Multi-Arm Unmanned Ground Vehicle (MA-UGV) from Intelligent Automaton, Inc. and is designed to do many different tasks with its three arms, each with multiple sensors including cameras. The volunteer in this video works for the company, and is fully aware of the robot's capabilities and safety features, if not its talent for hairstyling. 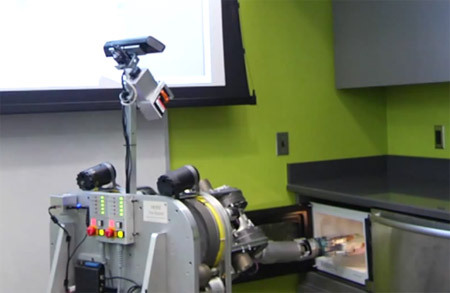 Graduate student Thomas Nierhoff at Technische Universität München in Germany equipped a two-armed human-size robot with a pool cue and connected it to a ceiling-mounted camera. 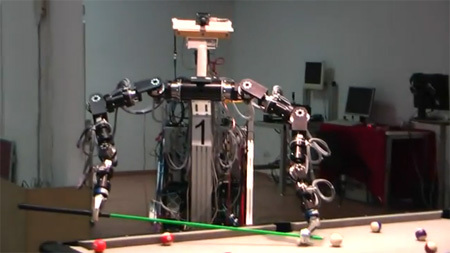 The robot analyzes the configuration of billiard balls and calculates the best angle mathematically before taking a shot. It's not yet perfect, but it's better than most non-professional players. 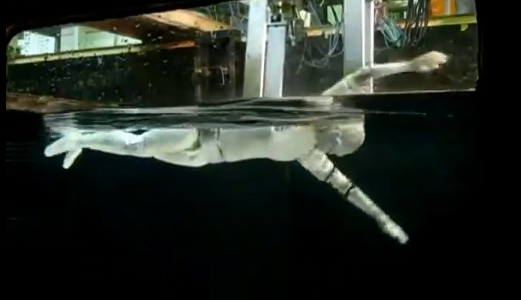 This robot is named Swumanoid, short for swimming humanoid. Developed by Chung Changhyun and Motomu Nakashima at the Tokyo Institute of Technology, the humanoid was built by scanning a real human body to recreate the exact shape. However, the robot is only half the size of a human. That makes it slower in relation to a human swimmer, but its purpose is sound: to study the mechanics of human movement and recreate them mechanically. As a side project, it may be used to test performance-enhancing swimwear. Researchers at the Ecole Polytechnique Fédérale (the Swiss Federal Institute of Technology) developed robotic flying quadrocopters that can be programmed for delicate tasks such as assembling buildings. Not only do they lift blocks and place them precisely, but they avoid crashing into each other while doing so. You can also see these robots demonstrating their skills by juggling balls. We want robots to do the tasks we humans don't want to do. Scooping up a pet's droppings should be at the top of the list! The University of Pennsylvania's GRASP Lab came up with the Perception Of Offensive Products and Sensorized Control Of Object Pickup (POOP SCOOP) system, which should win some kind of prize just for the convoluted acronym. 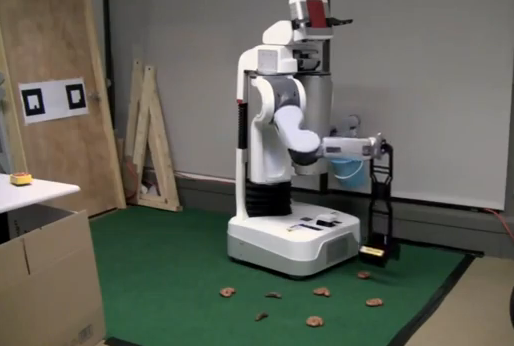 The robot scans with a color camera, determines what in the picture needs to be picked up, then uses a regular scooper and bucket to sweep the area. One can be yours, for a bit less than half a million dollars. Herb, the Home Exploring Robot Butler, was developed at Carnegie Mellon's Robotics Institute. Herb is mostly a research robot, and over time has been programmed to grasp objects, tidy up a mess, and cook dinners in a microwave. You'd think that would be enough, but Herb can also dance the Macarena! Japan is developing many robots specifically to help care for the elderly. 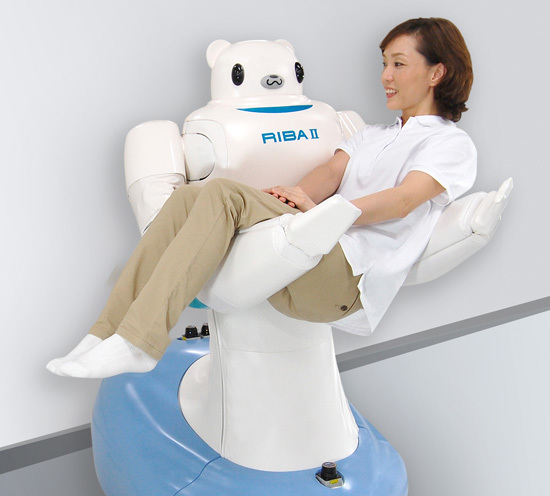 Riba II (Robot for Interactive Body Assistance) is a robotic nurse that is designed to resemble a teddy bear (after all, this is Japan, where cuteness is important). Riba II can gently carry up to 176 pounds, lift fallen patients from the floor, and transfer patients to and from beds and wheelchairs. It's a simple task for an industrial robot, but a nursing robot must be sensitive and able to respond consistently -and will save human nursing aides lots of wear and tear. 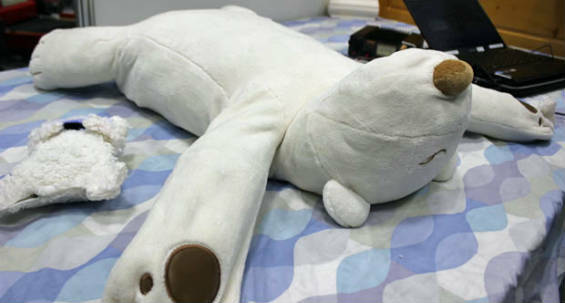 This teddy bear looks like a big pillow, and indeed it is meant to be slept upon. But it's also a robot called Jukusui-kun (Deep Sleep) that can sense when the sleeper is snoring. 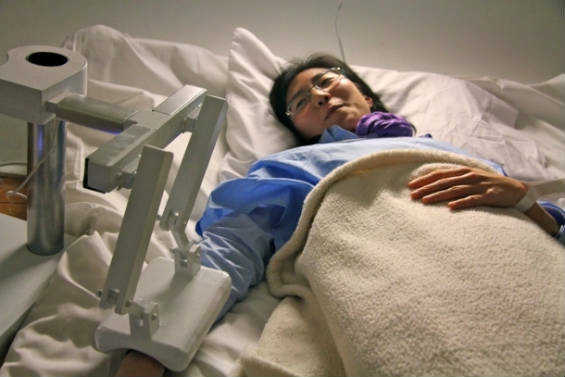 Developed by a team at Waseda University in Japan, the robot is meant to help those with sleep disorders, like apnea. 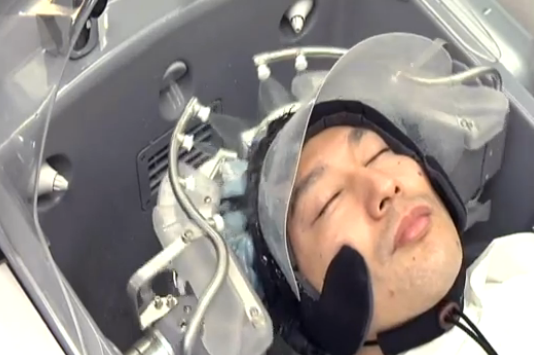 When the oxygen level of the sleeping person changes, or other breathing anomalies are detected, the robot bear softly bats them in the face, which causes the sleeper to change positions. The robot's monitoring system is completely wireless. I am the Last Moment Robot. I am here to help you and guide you through your last moment on Earth. I am sorry that your family and friends can't be with you right now, but don't be afraid. I am here to comfort you. You are not alone, you are with me. Your family and friends love you very much, they will remember you after you are gone. Now that is a robot that can haunt you even while doing exactly the task it was designed for. Maybe there are some things that humans should just do themselves.